Purchasing a home can be an exciting time in your life! You are putting down some roots, ready to personalize your own space and build equity in a property all your own. However, buyer’s remorse is an all-too-real phenomenon, and the last thing you want is to regret buying your property due to an unseen mold problem. 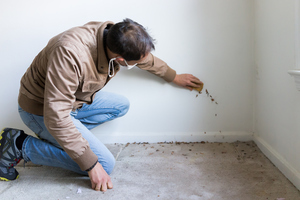 If you are working on buying a home, here is what you need to know about mold inspections. First, you can ask for a mold inspection specifically along with the home inspection before purchasing a home. Many people live in fear of finding mold and having their worst fears confirmed, but what most people don’t realize is that most forms of mold aren’t harmful. Additionally, many types of mold are fairly easy to get rid of. Next, keep in mind that even if an inspection does find mold, to determine the specific type of mold, you might have to have a sample sent away for further testing, which could cost an additional fee depending on the company you are working with. Finally, don’t forget to find out what the underlying problem behind any mold found is. If there is a leaky pipe with mold present, fixing the pipe will prevent more mold growth; however, the mold will still be present and will need to be remediated properly. Mold likes warm, dark, damp areas. If you remove the environmental factors, mold likely won’t grow there. For questions about mold inspections when buying a home, contact us here at AdvantaClean of Iredell County.